Sheer cashmere bliss! 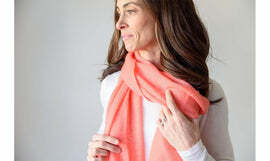 Soft, lightweight, airy loops of pure cashmere, knitted softly together to make this deliciously delicate, wrap finished with lightly curly fringed edges. Perfection has been found in this one for the, less is more traveler. Bundle up for warmth year round with this breathable beauty.